A while ago I mentioned participating in a group project called 198 Countries Peace Project (link to Ravelry). 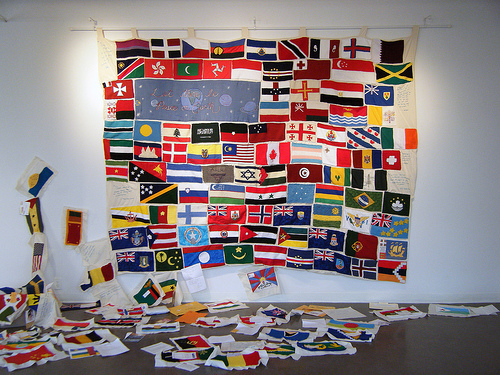 The idea is this: a flag for every nation of the world, sewn together to make a quilt. At the center would be the words “Let there be Peace on Earth.” I think it would be much more meaningful if it was a group project, rather than an individual one. For more information on what exactly the project entails, and how you can participate, check out the group pages, or go to the blog www.knotmagick.blogspot.com and navigate using the Peace Project Menu in the sidebar. I made two flags — Finland and Island. Estonia was taken and I thought it would be more meaningful not to make the flag of my own nationality. In the spirit of collaboration, peace, and all. The thesis show was set up on 1st of March and the author posted pictures to the Ravelry board. Since I didn't take any pictures of the flags I sent, I am posting the author's photos of the show with her permission. This is the overall shot of the project as it was displayed. Flag of Finland is the third flag on the third row from the bottom. 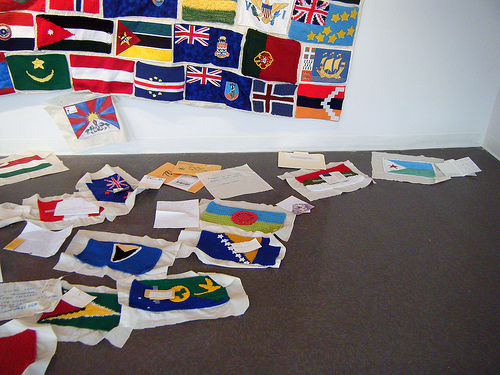 The flag of Island is the penultimate flag on the last row. The bottom right corner with a clearer view of the flag of Iceland. It is amazing what can be achieved with a little co-operation. I continually fail to understand how come there is so much hate in this world. Why can't we all get along?